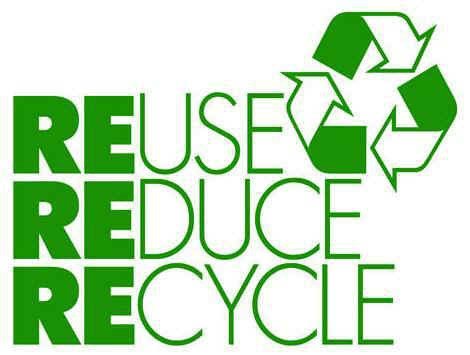 The three R's – reduce, reuse and recycle – all help to cut down on the amount of waste we throw away. They conserve natural resources, landfill space and energy. Plus, the three R's save land and money communities must use to dispose of waste in landfills. Siting a new landfill has become difficult and more expensive due to environmental regulations and public opposition. Buy products in bulk. Larger, economy-size products or ones in concentrated form use less packaging and usually cost less per ounce. Avoid over-packaged goods, especially ones packed with several materials such as foil, paper, and plastic. They are difficult to recycle, plus you pay more for the package. Buy durable goods – ones that are well-built or that carry good warranties. They will last longer, save money in the long run and save landfill space. At work, make two-sided copies when ever possible. Maintain central files rather than using several files for individuals. Use electronic mail or main bulletin board. Remove your name from the mailing lists of materials you no longer want to receive: write to Mail Preference Service, c/o Direct Marketing Assoc., P.O. Box 90008, Farmingdale, NY 11735. Use a dish cloth instead of paper towels. Reuse products for the same purpose. Save paper and plastic bags, and repair broken appliances, furniture and toys. Reuse products in different ways. Use a coffee can to pack a lunch; use plastic microwave dinner trays as picnic dishes. Sell old clothes, appliances, toys, and furniture in garage sales or ads, or donate them to charities. Use reseal able containers rather than plastic wrap. Use a ceramic coffee mug instead of paper cups. Reuse grocery bags or bring your own cloth bags to the store. Do not take a bag from the store unless you need one. Buy products made from recycled material. Look for the recycling symbol or ask store managers or salesmen. The recycling symbol means one of two things – either the product is made of recycled material, or the item can be recycled. For instance, many plastic containers have a recycling symbol with a numbered code the identifies what type of plastic resin it is made from. However, just because the container has this code does not mean it can be easily recycled locally. Check collection centers and curbside pickup services to see what they accept, and begin collecting those materials. These can include metal cans, newspapers, paper products, glass, plastics and oil. Consider purchasing recycled materials at work when purchasing material for office supply, office equipment or manufacturing. Speak to store managers and ask for products and packaging that help cut down on waste, such as recycled products and products that are not over packaged. Buy products made from material that is collected for recycling in your community. Use recycled paper for letterhead, copier paper and newsletters. Pickup of recyclables is once a week and differs depending on your neighborhood. If you live within the City of San Antonio's city limits, call 3-1-1 to establish new service. Once your request has been processed, your garbage (brown) cart and recycling (blue) cart will be delivered to your household. Take plastic bags back to participating retailers for recycling. DO NOT throw them in your blue recycle bin! You can learn more by going to the City's Recycling Overview site. Paper: Most types of paper, such as ad circulars, catalogs, carbonless paper, dry goods packaging with liners removed (example: cereal, pasta, rice, beer/soda cartons) envelopes, file folders, flattened cardboard, junk mail, magazines, newspapers, office paper, paperback books, paper bags, paper towel/toilet paper cores, phone books, non-metallic gift wrap. Plastics: Labeled #1 through #7 on the package, look for a recycling logo on the bottom or back of the container. Remove lids and rinse. Examples: beverage bottle, shampoo and lotion bottles, meat trays, condiment bottles, prescription and medicine bottles. Glass Bottles and Jars All Colors: Remove lids and rinse all food and liquids. Examples: beverage bottles, food and condiment bottles and jars (jelly, mustard, mayonnaise). Metal Cans: Aluminum, steel and tin beverage and food cans, rinse all food or liquids, aerosol cans, empty and remove nozzle, baking tins, rinse and remove remaining food. 56% of all paper used by households in America in 2007 was recycled – a whopping 360 lbs per person! The Benefits of Paper Recycling – Why Recycle Paper? SA Recycles: Join the movement. Do you recycle? The City of San Antonio wants you to join the recycling movement. It's easy to recycle, it benefits the entire city, and helps keep your garbage bill lower. Change Is In The Bag: This site is an effort to reduce the amount of plastic bags consumed everyday and to recycle the rest. The goal is to motivate San Antonians to use reusable bags when they shop and to recycle plastic bags at participating retailers when San Antonians receive them. Change is in The Bag is an alliance between the City of San Antonio, H‑E‑B, jcpenney, Target, Walgreens, Walmart, Keep San Antonio Beautiful and the Texas Retailers Association. Change is in the Bag Participating Retailers: San Antonio Waste Management says it is very important that San Antonian residents DO NOT toss their plastic bags in the blue recycle bins at their home. This leads to a variety of problems at the recycling center which is better set up for the recycling of aluminum cans, plastic bottles, paper, etc. Instead, Change is in The Bag® urges people to take their plastic bags to the participating retailers listed above for proper recycling.